Canadian Eric Monkman is an unlikely hero–but maybe he is the hero Britain needs right now. Whatever, we’re pretty certain that #Monkmania could only happen in Britain. Monkman, an economics student from Oakville, Ontario lives in the UK and studies at Wolfson College at Cambridge University. 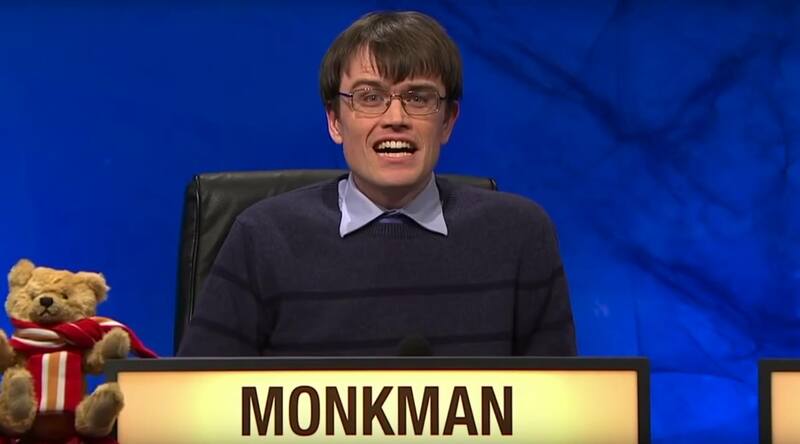 But everything changed when Monkman began appearing on long-running UK student quiz show University Challenge last year. From the outset, social media went nuts for Monkman’s animated face, as he led his team to victory upon victory in the hardest quiz on British TV. And when we say hard, we mean hard. If you’re watching University Challenge at home, it’s a personal victory if you get just one question right. But the brutal questioning by host Jeremy Paxman (think Peter Mansbridge but with a hostility which petrifies all British politicians) was no match for Monkman. That is, until this week, when at the height of #Monkmania, he and his team lost out in the final round to a team from Oxford’s Balliol College. Damn. Having said that, Monkman did get to meet his idol infamous theoretical physicist Professor Stephen Hawking. Or rather, Hawking got to meet Monkman. Despite Monkman’s loss, #Monkmania lives on. Here’s a roundup of the best of #Monkmania from our excitable British cousins.